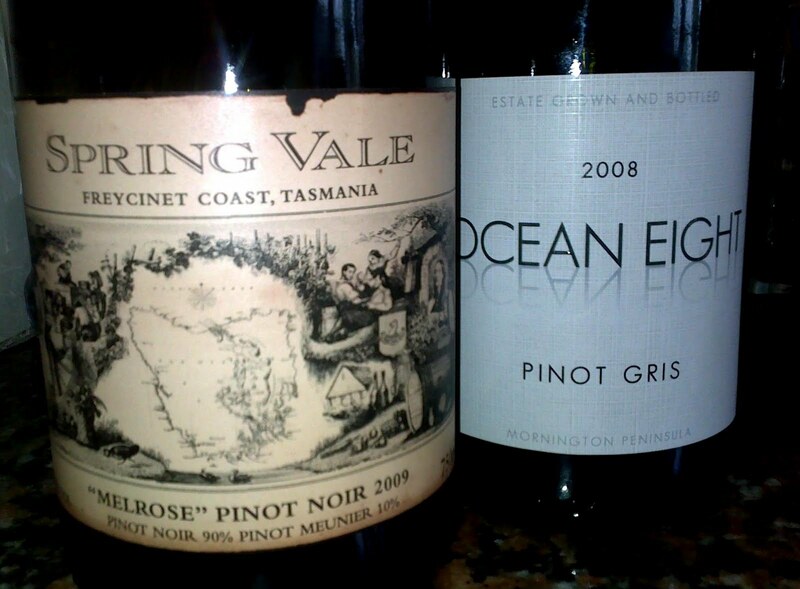 Tried a Tasmanian Pinot Noir on the weekend, from Spring Vale vineyard. I was pleasantly surprised! I don’t usually drink Pinot Noir much but this Tasmanian wine was well structured but delicate, with small berry type fruits, a little cassis, and smooth subtle oak underlying. Also it was 2009 but tasted older for it’s age – like an ’08/’07 Pinot, with no harsh acidity or what I think of as a slightly metallic finish. I’ve been hearing about Tasmania’s increasing reputation for some great cool climate wines, particuary if the grapes can be sourced from Tasmania only. This region also tends to have similar climate and weather to Europe and produces lovely varietals (Pinot Gris/Griogio, Gewertztraminer etc), as well as the more common Pinot Noir, Chardonnay,Chardonnay Pinot Noir Sparklings, Sauv Blanc and others. I’ve so far found Tasmanian wines to have a very elegant palate, with enough small ripe fruit yet still maintaining those cooler characteristics. Looking forward to trying more good Tasssie wines! I agree completely that the Spring Vale Pinot Noir is a quality drop! Another decent Tassie Pinot is from Bay of Fires, the winery famous for the "Aras" sparkling which is largely considered one of the best sparkling whites made in Oz! If you liked this and don't drink allot of Pinot try a few from South Victoria, Geelong and Mornington Peninsula area's are producing some awesome Pinot such as Bass Phillip and By Farr or Farr Rising.